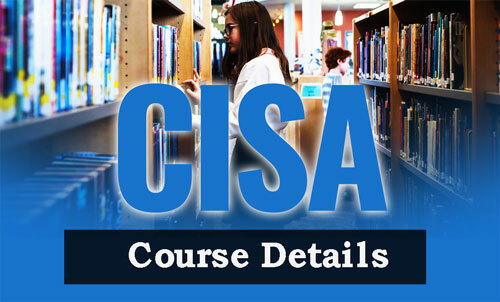 CisaCourseDetails: Have you ever heard about CISA course? If your answer is no, then let me clearly explain you the cisa course details, its eligibility and career opportunities after completion of the course. CISA full form is Certified Information Systems Auditor and it is a certification course in the field of Audit, control and security of Information systems. What is CISA Course ? 1 What is CISA Course ? A certified holder of CISA plays a major role in verifying Audit documents of a particular organization, skills, knowledge and demonstrates whether you are capable in functioning the organization goals and objectives correctly. There on he reports on compliances and implement controls within the enterprise. CISA is launched in 1978, and held by over lakhs of IT and Accountancy professionals worldwide empowered under ISACA. Training for this program provides a comprehensive revision for the key job practice knowledge exercises. It helps to delegate the various ways of qualifying the exam at the very first attempt. This course has been designed to maximize time effectiveness and reduces any unnecessary time away from the office. It has also been shown to be more considerably more effective than self-study preparation, which requires more time and commitment. To pursue CISA certification, a minimum of 5 years professional work experience in Information systems auditing, control or security is required. Substitutions to work experience may be applied for a maximum of 3 years. ISACA allows the following qualifications. A maximum of 1 year Information systems experience or 1 year of non-IS auditing experience can be substituted 60 to 120 completed university semester hours (equivalent of a 2 to 4 year degree 0 not limited by the 10 year proceeding restriction can be substituted for 1 or 2 year of experience respectively. A bachelors/master’s degree from a university that enforces the ISACA model curricula can be substituted for 1 year of experience. Two year as a full time university instructor in a related field such as a computer science, accounting, information systems, auditing can be substituted for 1 year of experience. Also See: PGDCA Course, SAP Course, AMIE Course. NOTE: work experience and educational requirements are necessary for the student to take CISA exam. It is like a five step process. There are 5 domains in the core structure. Domain 1: The process of auditing Information systems. Domain 2: Governance and management of it. Domain 3: Information systems acquisition, developments and implementation. Domain 4: Information systems operations, maintenance and support. Domain 5: Protection of Information assets. CISA exam is available twice a year either the candidate may apply for September term examination else for December. Enter the main website of ISACA. Select the online application form. Fee can be paid either online through debit/credit cards else can draw a draft in favor of ISACA. Save the application form for further reference. Once a CISA candidate has passed CISA certification exam and has the work experience require nets, the final step is to completed and submit a CISA application for certification. All the applicants are required to submit their relevant work experience certificates as mentioned earlier in the respective fields. i am a b.com pursing in university and can i do for admission in cisa exam?